Monthly Bulletin - Blog, Quiz, Course schedules, Webinars & more! FALL SCHEDULE: Live member webinars not to be missed! Italian Wine Scholar Manuals (Unit 1) have started to ship around the globe and most e-learning modules have been released! Distance-Learning, including a state-of-the-art E-learning program! Classroom-Learning at over 25 wine schools around the world! More dates and locations to come shortly! 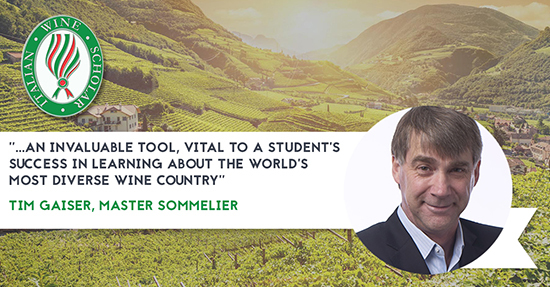 Upcoming French Wine Scholar sessions are currently scheduled at approved program providers around the world: United States, Canada, South America, Asia, Europe and Australia. Our program provider network is growing with new partner schools in: Denver CO, Charlotte NC, Norfolk MA, Miami FL (USA), Calgary (CAN), São Paulo (Brazil), Santiago (Chile), Sussex (UK), Bordeaux (France), Shenzhen (China), South Australia, Seoul (South Korea). Coming soon: Belgium, Netherlands, Finland, Sweden, Germany, Greece, Switzerland, Italy, Spain, Portugal, Taiwan, Tasmania (Australia) and more! Our next online, timed member quiz will run next week and focus on everything that has changed within the world of French wine in the last couple years. Think you are up-to-date on French wine? Get ready to challenge yourself! The top quiz scorer will will a $300 WSG gift certificate and will be featured on our next monthly bulletin! We have three study trips coming up this fall and registration will close shortly! Reserve yours today to prevent disappointment! Travel with fellow committed students of wine and share a study trip of a lifetime! "Enjoyed Andrew’s lectures and accounts which had no wasted words, precise and insightful. He is a true professional and up-to-date scholar (rare) whose precise explanation was very helpful" Yuki Saito, AIWS, CS, Wine Writer/Journalist, San Francisco, California. Be among the few to master this diverse and authentic wine region! Trips to the Southwest wine region are few and far between. Don't miss out. Enjoy Southwest France' local cuisine, a star of the French food scene! Classics such as foie gras, duck confit or cassoulet are soul-satisfying, traditional dishes that originate from this region! It is also rich in freshwater fish, truffles, cèpes and locally grown fruits and vegetables. The Southwest wine region also possesses breathtaking beauty! From vast fields of sunflowers, rolling hills and vineyards to historical medieval villages and beautiful river gorges…this region has it all. It is a feast not only for the palate but also the eyes! The wine tour includes a stop in Armagnac, discover how it is made and learn to taste and savor France’s oldest and most artisanal brandy. Learn more about our Southwest France study trip and register today! Discover the prestigious wines of the Côtes d’Or, the bone-dry whites of Chablis,the approachable whites of the Mâconnais, the hidden gems of the Côtes Chalonnaise! Visit the most celebrated grand crus of Burgundy. Experience insider tastings with winemakers at top Burgundy estates! Discover the picturesque Beaujolais region and its excellent crus during a private tasting with Beaujolais’ top winemakers. Lunch and dine in some of the region's best restaurants and discover the fine local cuisine paired with the excellent local wines. Embark with your instructor, Essi Avellan, world-renowned champagne specialist, wine author and Master of Wine. Tour the different sub-regions of Champagne to get a complete and in-depth view of the appellation. Taste with and and learn directly from the cellar masters of some of the most prestigious champagne houses. Visit some of the best small grower Champagne producers in Grand Cru and prestigious champagne producing villages. Taste the base wines from Pinot Noir, Chardonnay and Meunier and gain a deeper understanding of the importance and art of blending. Dine in the region's best restaurants, and enjoy special champagnes paired with the local gastronomy. NEW: WINE SCHOLAR GUILD BLOG! Italian red grapes and the regions that love them Native Italian grape varieties saved from near-extinction! Congratulations to Mark Pygott, MW, FWS for becoming a Master of Wine last week and for passing the French Wine Scholar exam with the highest honors! Mark is now an approved instructor to teach our French Wine Scholar program at Taiwan Wine Academy! Last week, mark was among the 13 talented individuals who earned the coveted Master of Wine title delivered by the Institute of Masters of Wine.